One of the biggest Easter eggs in The Walking Dead - and the one most likely to be pointed to as irrefutable evidence of a shared universe - is the apparent presence of the blue meth first produced by Walter White and Jesse Pinkman in Breaking Bad. This comes fairly early on in the show's run, during Season 2's Bloodletting. 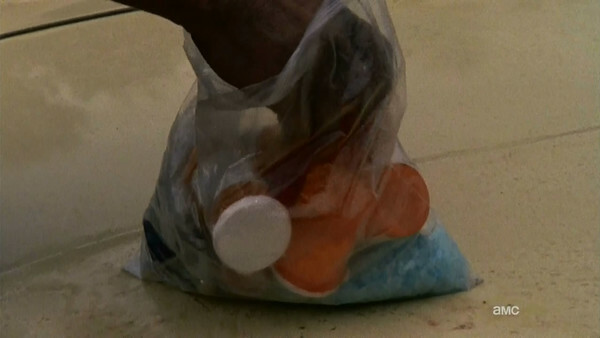 Needing to find medicine for T-Dog, Daryl goes rummaging through his brother Merle's drug supply, and at the bottom of the bag we see the blue meth. Given the coloured drug was unique to the show - even if other people may have started making it afterwards - it's a pretty clear nod towards its fellow AMC series, which was still on the air at this moment in time. It's not entirely impossible that it came directly from Walt and Jesse, since Merle had travelled around a fair bit, but it's also plausible that this was an imitation of Blue Sky. The drug was hugely popular, after all, so there's a chance word spread further out and someone in Atlanta decided to try and copy it.